Habitat works in a number of different ways to create decent, affordable housing. 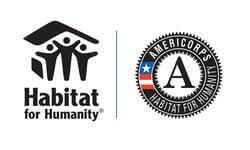 In addition to new construction, Habitat also renovates existing buildings in many communities, particularly in urban areas. Habitat’s Home Preservation and Neighborhood Revitalization help people repair and improve their own homes and neighborhoods. Our Disaster Response program also works with local communities to address a variety of housing needs after natural disasters. Habitat’s partnerships and advocacy work help raise the awareness and support needed to address housing needs around the world. In almost 40 years of helping families improve their housing situations, we at Habitat for Humanity have seen firsthand how critical housing is to families and to communities. We realized from the beginning that when we build structures, we are also building dignity, hope and opportunity. It is about helping families lift themselves out of poverty to become self-sufficient. Our efforts help people realize improvements in health, education outcomes and employment, and we have been instrumental in revitalizing communities and changing policies and systems that hinder access to adequate shelter. At its core, Habitat is also about giving meaning to volunteers and supporters. Imagine a 3-year-old who is so excited about having a bathroom in her home that she gets up every morning to clean the sink. Imagine feeling like you have no purpose in life until volunteering alongside other families to help them create a simple, decent place to live changes your outlook. Imagine moving into a healthy environment after raising children in what had been labeled a “lead deathtrap.” And imagine being a young woman who was able to finish law school because of the stability provided by living in a safe, permanent, decent home. We also know that housing is just as important to the health of a community as it is to the health of individuals. Investing in sustainable, affordable housing attracts new businesses, creates jobs and, many times, makes communities safer. On many occasions when Habitat has served as a catalyst and organizer, communities have rallied together to develop innovative ideas that lead to positive change. In addition, homes in many disaster-prone areas are now better able to withstand the damage caused by earthquakes and storms.